One of Ireland's wealthiest people has lost a defamation action against a Sunday newspaper. 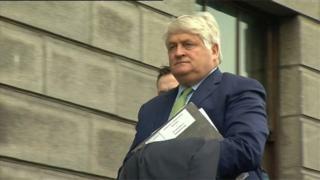 Denis O'Brien had sued the Sunday Business Post over a 2015 article which discussed some of his bank borrowings. Mr O'Brien claimed it had portrayed him as part of a "gang" of property developers who had destroyed the country and bankrupted its banks. The newspaper said the article did not mean what Mr O'Brien had claimed. A jury found in the newspaper's favour. The paper's chief executive, Siobhan Lennon, said the case had highlighted how Ireland's defamation laws "place significant constraints on all media outlets in their efforts to provide robust, objective and fair scrutiny." Mr O'Brien, who is considered to be a billionaire, owns the telecoms firm Digicel, which operates mainly in the Caribbean and Central America. He also owns a variety of media businesses in Ireland, including Independent News and Media which owns the Irish Independent and Communicorp Media which owns Newstalk.